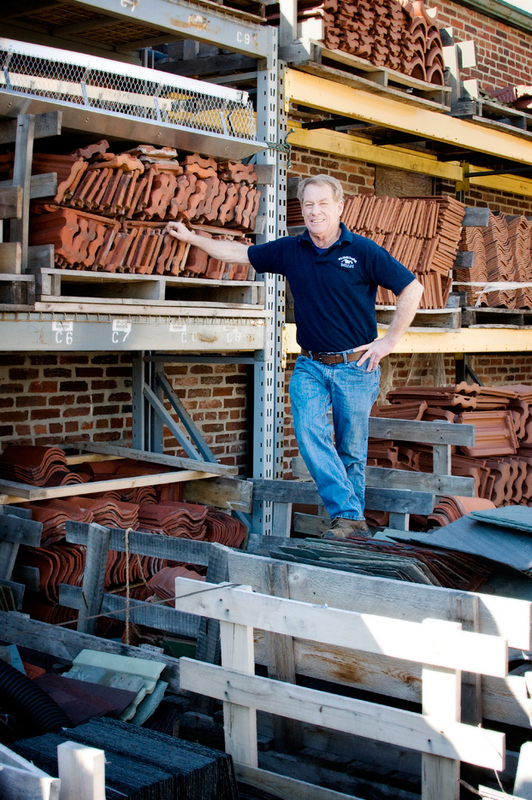 Dan Hagerty, owner of Old World Roofing, crafts clay tile roofs that last a lifetime. Old World Roofing, a family owned and operated company, was founded in 1986 and specializes in slate and tile roofing. Their high standard of workmanship has made them a trusted source for beautiful crafted roofs in the St. Louis area. SLHL: Why consider a tile roof? What are its advantages? Dan: A clay tile roof adds character and beauty, enhancing the appearance of a home. With several different types of tile available, as well as an assortment of styles and numerous colors to choose from, there is so much variety in building a tile roof. A homeowner or builder can create a beautiful and truly unique work of art for their neighborhood to admire. There are some really awesome homes in our area, and it is easy to see the impact that the craftsmanship of a gorgeous tile roof can make to top off a home, and essentially enhance an entire area. Also, a properly installed tile roof will offer years of protection from the extreme weather that we have in this part of the country. The advantages are not only cosmetic, but also cost effective and eco-friendly. SLHL: How long do tile roofs last? Dan: A clay tile roof will easily offer 75+ years of service to a home—on top of that, a tile roof can be removed and reset, with proper flashing and felt, to last another 75+ years. There are clay deposits worldwide, which is why there are tile roofs spanning throughout the world. SLHL: Are tile roofs available in styles or colors other than a Spanish style? Dan: Clay tile roofing systems are available in multiple styles, shapes, sizes and can be custom designed to match almost ANY color. Throughout the world, these factors vary, and you will see a ton of different looks depending on where you are. Spanish tile is just one style—to name a few more, tile can be curved, flat, thick, thin, wavy, etc. Most clay tile used to install roofs in St. Louis and much of the Midwest are produced in New Lexington, OH. SLHL: Do tile roofs work on any home? Dan: In short, no. Tile roofs are unique, and most homes cannot withstand the weight of a tile roof. Tile roofs weigh at least three times more than a shingle roof. In addition, the pitch of a roof has a lot to do with the type of material that should be installed. For example, a lower sloped roof with a pitch 3/12 or less should not have a tile roof because of the built-in lack of drainage. SLHL: How are tile roofs sustainable? Dan: Clay tile is, quite possibly, the most “green” you can get for a roof. In addition to the durability and 75+-year lifespan of a tile roofing system, tile is a product that is both natural and recyclable. Tile is a product that is designed to not fade and will truly last a lifetime. Ludowici (out of New Lexington, where we get our clay tile at Old World Roofing Co., LLC) offers a 75-year warranty on their clay tile, guaranteeing that it will be free of manufacturing defects and maintain its color. A tile roof also can aid with energy efficiency in a home or building.